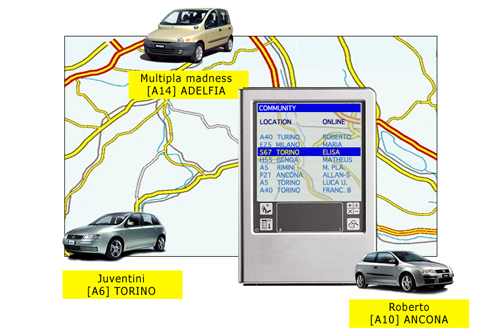 A wireless Fiat community-building concept shaped as a highway service that allow drivers to interconnect. The concept introduces new distributed touchpoints between customers and Fiat as a way of radically innovating the brand-experience. The aim was to inspire the chief designers, researchers and management at Centro Stile in Torino. The assignment was mediated by the Dutch design platform YDI and carried out in Amsterdam and Torino. Nominated for the Young Designers & Industry Award 2001. Client: Fiat Auto - Centro Stile, Torino, 2001.